We’d love your help. 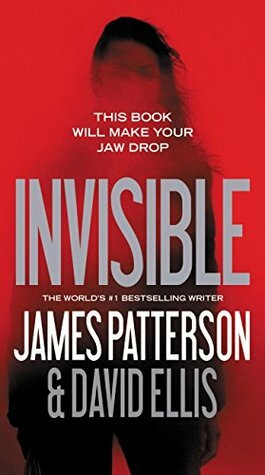 Let us know what’s wrong with this preview of Invisible by James Patterson. Not even Emmy's ex-boyfriend, field agent Harrison "Books" Bookman, will believe her th Everyone thinks Emmy Dockery is crazy. Obsessed with finding the link between hundreds of unsolved cases, Emmy has taken leave from her job as an FBI researcher. Now all she has are the newspaper clippings that wallpaper her bedroom, and her recurring nightmares of an all-consuming fire. To ask other readers questions about Invisible, please sign up. I'm really enjoying this book so far and can't wait to read more of Patterson's works. I'm not sure of the best place to ask a question about all of this books. James has quite a few books and I'm trying to determine which one to read next. I'm not sure I want to get into books in a series yet, but can anyone recommend his top 5 best books? I want to read those next and then I'll move toward the books in the series. I can always rely on Patterson for a good, escapist mystery. This one was co written with David Ellis and it was very well done. Recommended if you enjoy lots of action, many dead bodies and edge of your This was a great read, one of those books it is impossible to put down until the very last, totally satisfying, page. Admittedly the main character was a total idiot and I honestly could not understand what Bookman saw in her, but it all made for a really good story with a very dramatic finale. As more and more deaths continued to occur, always a house fire, a Emmy Dockery had lost her sister Marta to a house fire eight months previously, a fire the authorities had called accidental. But Emmy was convinced Marta’s death wasn’t an accident; she was an FBI analyst and because she was consumed by grief had been put on indefinite leave. Emmy in the meantime had been researching house fires right across the US, doing the leg work on her own as no-one within the FBI would believe her claims. Let's get this over right away - STOP the stupid music in your audiobooks. You and your production editor may think that this adds 'mystique' or 'character' or a 'third voice' to the production. No. IT DRIVES AUDIO LISTENERS INSANE! Here's the scoop -- in case none of you have ever listened to an audiobook -- the reader is creating their own scenes, character portraits and drama as they listen to the book. They do not need the remedial aid of music. If we wanted to hear music, we'd go to our music list and play that. The music is distracting and unfortunately quite loud so that it opacifies the voice of the narrator. Do you want the words to your story told, or do you want to do a theatrical production? You choose. Then we'll choose whether we ever want to read another one of your books. Until then, you'll get poor ratings from this reader and others. I am going to just jump right in and say that this book scared the hell out of me! Patterson and Ellis have written the most terrifying villain since Hannibal Lector first gave me nightmares years ago. It was chilling! It. Was. Delicious! This book made me remember late nights with the covers pulled up to my chin, knowing the next scene on the screen was going to make me scream! Lovely, scary story. Emmy is going right to the top of my favorite heroines list. She is strong, she is determined and she is grieving. One of those deaths she is investigating is the death of her sister, her twin sister, Marta, a death that has been labeled an accident by the local authorities. Death by fire. Emmy is convinced that Marta’s death was no accident. In trying to find evidence to prove her theory, she begins to uncover more and more accidental deaths by fire that seem similar to the circumstances surrounding her sister’s death. But no one believes her, and her credibility with her FBI supervisor is already in jeopardy over an unrelated issue. This book is not a romance, but there is a love interest. With no help from her own supervisor, Emmy appeals to her former fiancé, Books Bookman, a retired FBI special agent, to use his influence to have the FBI take a more serious look at the evidence she has found. With his help they begin to make a case that the FBI can no longer ignore. In the meantime, throughout the story, the villain taunts us with his manifesto. Taunt after taunt. I wanted to help hunt him down. Pure evil. The ending of this story, this hunt for a demented killer, will make me lose sleep. Just when I was convinced that I had it all figured out, I was wrong. The ending is stunning. I know that this book is labeled as a stand alone, but I would love to see more of Emmy and Books. What a team. What a story. What a rush! I remember reading Patterson in the early days of Alex Cross novels. I loved the pacing and twists and turns the stories would take. Though maybe not literary masterpieces they were the kind of books I had a hard time putting down. Over the years something has changed - part of me feels that it is Patterson's writing in combination with the fact that there are so many excellent suspense/thriller books out there. In any case I knew exactly what I was getting myself into. I needed something fairly I remember reading Patterson in the early days of Alex Cross novels. I loved the pacing and twists and turns the stories would take. Though maybe not literary masterpieces they were the kind of books I had a hard time putting down. Over the years something has changed - part of me feels that it is Patterson's writing in combination with the fact that there are so many excellent suspense/thriller books out there. In any case I knew exactly what I was getting myself into. I needed something fairly "mindless" to fill the reading gap between the "heavier" books I've been picking up lately. Invisible is a stand alone novel and that was a part of its appeal. Emmy Dockery is an FBI research analyst obsessed with a series of fires that have been declared accidental. Emmy is convinced that they are a work of an extremely meticulous arsonist who is so good that he managed to make himself invisible to the police. She is also emotionally damaged (in more ways than one) and not the easiest person to like. In her quest to convince her agency that she is not delusional and that these murders are actually happening she enlists the help of her ex-boyfriend and a former FBI agent, Harrison Bookman. Despite their complicated personal relationship they join forces in an attempt to uncover enough evidence in order to prove that there actually is a killer before they can even begin hunting him. I loved this one. It was nice to read another stand alone Patterson novel and know that there won't be a sequel so anything, literally anything, can happen. I thought the character of Emmy was awesome, however I wasn't entirely a fan of Books the whole time. At one point, well, let's just say I had my doubts. The twist at the end really got me! I loved it and I hope he returns to write more stand alone novels like this instead of rewriting the same basic story over and over again in his I loved this one. It was nice to read another stand alone Patterson novel and know that there won't be a sequel so anything, literally anything, can happen. The twist at the end really got me! I loved it and I hope he returns to write more stand alone novels like this instead of rewriting the same basic story over and over again in his newer Cross novels, sadly. Todo o livro é inteiramente compulsivo, com a parte final a alcançar o êxtase total, só não leva as 5*, porque a determinado momento achei a protagonista (Emmy) uma autêntica “tia de Cascais”, com tiques de quero, posso e mando. Mas não deixem de ler, a pesquisa elaborada para nos apresentar os factos sobre mortes “invisíveis” são de colocar qualquer um de boca aberta e com os cabelos em pé. I did not plan to read this book in a day, it just happened that way. I wanted to give this 4 stars, due to the action and suspense, but I have to deduct a star for the annoying main character. At first, Emmy is a dedicated FBI analyst with dreadful people skills. She's rude, selfish, unappreciative, jealous, and naive. Okay, I can deal with some of that, as she is the relative of a crime victim. But when she *twice* runs into a crime scene against orders (remember, she's a civilian, not an agent!) and risked the lives of others, I really wanted her to suffer the c I wanted to give this 4 stars, due to the action and suspense, but I have to deduct a star for the annoying main character. At first, Emmy is a dedicated FBI analyst with dreadful people skills. She's rude, selfish, unappreciative, jealous, and naive. Okay, I can deal with some of that, as she is the relative of a crime victim. But when she *twice* runs into a crime scene against orders (remember, she's a civilian, not an agent!) and risked the lives of others, I really wanted her to suffer the consequences. I wanted her to get fired and have to teach preschool with a whole classroom of children with the same lack of obedience and respect for others that she showed. Dentro dos livros policiais, os que mais gosto são os que envolvem serial killers. Gosto de perceber o que se passa pela cabeça de um assassino em série e saber o que o motiva a matar desenfreadamente. Em Invisível a dupla James Patterson e David Ellis, a mesma do livro A Amante, publicado recentemente pela Topseller, fez-me criar empatia com o livro logo no início, o que para mim não é muito normal. Reconheço que até me envolver na narrativa o início dos livros muitas vezes se torna entediante. N Dentro dos livros policiais, os que mais gosto são os que envolvem serial killers. Gosto de perceber o que se passa pela cabeça de um assassino em série e saber o que o motiva a matar desenfreadamente. Não foi o que aconteceu aqui. Um assassino em série perspicaz e inteligente anda a cometer aquele que eu considero o crime perfeito. E só foi apanhado porque uma das suas vítimas era irmã gémea de uma analista de informação do FBI, o que a levou a suspeitar do "acidente" que vitimou a sua irmã. This felt more like a bad episode of Criminal Minds than a great read. I expected more smart writing, more excitement, more gravitas, and I was sorely disappointed. There wasn't much content to this so-called thriller/detective story, except the many pages that were narrated by the serial killer, which added little or no quality to it. Personally, I'm sick and tired of this format where half of a book is from the bad guy's perspective. There's no plus side. It borders the unhealthy, IMO. As for t This felt more like a bad episode of Criminal Minds than a great read. I expected more smart writing, more excitement, more gravitas, and I was sorely disappointed. There wasn't much content to this so-called thriller/detective story, except the many pages that were narrated by the serial killer, which added little or no quality to it. Personally, I'm sick and tired of this format where half of a book is from the bad guy's perspective. There's no plus side. It borders the unhealthy, IMO. As for the final pages, I already knew who Mary was and that it was going to end badly. Tinha uma "alapata" com o Patterson, confesso. Não gostei muito do Alex Cross, então pensava que era autor a pôr de parte. Depois de ler o casa da morte, fiquei com muita curiosidade de ler algo mais!! Este foi uma surpresa mesmo boa, um livro com um ritmo super acelerado, com pouquíssima palha, bem engendrado e, só desconfiei daquele final, quase quase no fim!! ”Our subject has committed unspeakable acts of torture and managed to remain completely invisible”. I have to start out by saying this thriller has raised the bar of all thrillers I have read. Finding the invisible is what makes this such a page turner. Former FBI Analyst Agent Emmy Dockery is consumed by the death of her sister. A death that appeared accidental by fire in her bed. Being the Analyst that Emmy is, it does not add up and she is determined to find the truth of her sister’s death. She ”Our subject has committed unspeakable acts of torture and managed to remain completely invisible”. Former FBI Analyst Agent Emmy Dockery is consumed by the death of her sister. A death that appeared accidental by fire in her bed. Being the Analyst that Emmy is, it does not add up and she is determined to find the truth of her sister’s death. She begins to look at other accidental death fires and sees a pattern that she cannot ignore. The commonality is all the victims is that it appears accidental, there is always one death, the victim is found at the point of origin of fire, and the origin of fire is always the bedroom. She calls on the help of her former fiancé and fellow Agent Bookman to help her spiel her findings to her former employer the FBI to get a massive hunt underway for to capture the invisible killer. As they learn more, they realize they are dealing with brilliance but also the depth of this killer’s depravity. Agent Bookman is the rational to Dockery’s emotional. There is real chemistry between the two agents with their history and their baggage. That is what makes it such a great connection to readers, we can relate to the baggage we carry into our relationships. I really like the protagonist-Emmy she is black and white and she is determined while Agent Bookman cares deeply for Emmy and has her back. The narration is done by 2 –part Emmy with her wit, determination, and never giving up attitude. The other part told by the antagonist; the pyscho killer. The narcissism as he brags on how careful he is and his justification for what he is doing makes him the easy to hate character. With a surprising ending that left me undone and totally gotcha just made it more sweeter. I liked that this was not gory glorification but a fast paced get her done thriller. I loved reading this one. Invisible is a stand-alone novel by prolific American author, James Patterson. It is (co-) written by David Ellis. When Emily Dockery’s twin sister Marta died in a fire, she refused to believe it was an accident. As an FBI research analyst, she began to research similar fires and became convinced that there was a serial killer on the loose. Unfortunately, no one else agreed: not her boss with his wandering hands; not her ex-fiancé, Harrison (Books) Bookman; not the local police; and not her grie Invisible is a stand-alone novel by prolific American author, James Patterson. It is (co-) written by David Ellis. When Emily Dockery’s twin sister Marta died in a fire, she refused to believe it was an accident. As an FBI research analyst, she began to research similar fires and became convinced that there was a serial killer on the loose. Unfortunately, no one else agreed: not her boss with his wandering hands; not her ex-fiancé, Harrison (Books) Bookman; not the local police; and not her grieving mother. Despite being suspended from her job, Emmy continues to gather possible cases. Her last hope is that showing him the files on fifty-three such events over the last twelve months will persuade ex-FBI agent Books to come out of retirement and investigate. She’s pleased when this last-ditch attempt gets an investigation started, even is the task force consists of a team of just four. The narrative is carried mostly by Emmy, with occasional interspersed chapters which are transcripts of dialogue dictated by the murderer: these come across as rather gimmicky. There is some clever investigative work and an exciting climax with a huge twist, but Emmy, despite her brilliance, indulges in a sort of spoiled brat behaviour that is not endearing. Just an OK read that might appeal to fans of serial killer mysteries. It has been forever since I read a really good thriller and even longer since I have picked up a Patterson book. When you combine the two however, you know you are in for a treat. What can I say about this that won't give anything away? How about that there were so many tense moments, so many twists and turns and so much of the unexpected that I couldn't help but be drawn to it. I couldn't help but want to read every single page of it. This is one of the few Patterson mysteries that I have read i It has been forever since I read a really good thriller and even longer since I have picked up a Patterson book. When you combine the two however, you know you are in for a treat. How about that there were so many tense moments, so many twists and turns and so much of the unexpected that I couldn't help but be drawn to it. I couldn't help but want to read every single page of it. This is one of the few Patterson mysteries that I have read in awhile that I truly liked with it's dark twisted ways. Like most of his work, the heroine isn't perfect and is in fact, is quite screwed up and damaged but that is okay because it makes her all the more real and believable. The romance is subtle and takes a back seat to the real heart of the story, catching a serial killer that no one else believe exists. Wow! This is the best Patterson book I have read in years! The last few years I haven't been reading his books because they lacked something but this was a real thriller I found hard to put down. Emmy is a FBI research analyst who recently lost her sister to a house fire. She begins to suspect that the fire wasn't random and that it was really planned by a serial killer. The fire investigators and medical examiners can't find anything to indicate murder but Emmy is like a dog with a bone who won' Wow! This is the best Patterson book I have read in years! The last few years I haven't been reading his books because they lacked something but this was a real thriller I found hard to put down. What a refreshing change from some of the very disappointing reads that have been released recently under the James Patterson brand. I was getting very close to stopping reading his novels completely due to the poor books he has released lately under different guises. This book is like going back to the early books which were a big success with their short punchy chapters and plenty of action. Again this book is co-written so it is difficult to tell what input Patterson had exactly but neverthel What a refreshing change from some of the very disappointing reads that have been released recently under the James Patterson brand. I was getting very close to stopping reading his novels completely due to the poor books he has released lately under different guises. This book is like going back to the early books which were a big success with their short punchy chapters and plenty of action. Again this book is co-written so it is difficult to tell what input Patterson had exactly but nevertheless it ticks all the boxes. A very entertaining read that I completed in less than 24 hours due to the tension it produced. This book was terrible! I generally enjoy Patterson, but this book was not at all enjoyable. Despite an exceptionally interesting premiss, the story was flat and the characters unappealing. I flipped through to the end to find out whodunnit and never looked back. Another author asked, "is James Patterson an author or a brand?" and this question is worth asking after such a disappointing read. This was another thrill-riding book by James Patterson. I highly recommend it to all JP fans. All I can say is..."Enjoy the ride". Crushed this book in 2 mornings of coffee and sun lounging. Really good, an extremely thrilling read and then a delicate twist at the end. Bashing prolific author James Patterson has become almost an art form over the past couple of years, and I freely admit to being among those who haven't had good things to say about most of what I've read of late. It has reached a point, in fact, when I pick "his" books by co-author because experience has taught me that some of those folks are better than others. That said, I don't recall reading any co-written with David Ellis - somehow I skipped the fairly recent Mistress and Guilty Wives. But Bashing prolific author James Patterson has become almost an art form over the past couple of years, and I freely admit to being among those who haven't had good things to say about most of what I've read of late. It has reached a point, in fact, when I pick "his" books by co-author because experience has taught me that some of those folks are better than others. That said, I don't recall reading any co-written with David Ellis - somehow I skipped the fairly recent Mistress and Guilty Wives. But in fact, Ellis is a fairly prolific author on his own; while his books don't have tons of reviews at Amazon, those that are there are quite positive. Still, I didn't open this one with high expectations; but I figured it wouldn't take long to read (it's 399 pages, but if tradition holds, quite a few of those would be a several-chapter preview of a yet-to-be-published book). I was right on both counts, but here's the surprise: I liked it! That's not to say it's anywhere near perfect; the plot - an on-leave FBI researcher insists there's a serial killer out there who's racked up dozens of victims all over the country including her twin sister, but nobody believes her including her FBI field agent and ex-fiance - isn't exactly unique. Of course, she persists, collecting data on supposedly accidental deaths by fire until finally she turns up some evidence that suggests she may be right - sparking a full-out investigation. Interspersed throughout the book are "recordings" made by the killer, who clearly is deranged; the victims are tortured almost beyond imagination, after which all-consuming fires destroy nearly all of the evidence but are made to appear accidental. That, too, is hardly unique, but it's a technique that kept me reading and trying to guess who the killer might be. And guess correctly I did - several chapters before the end - but I had no idea what the killer's motivation could be. As it turned out, I could have guessed till the cows come home and never got it right (and I admit it was more than a little on the weird side and tests the limits of believability). But all in all, it was a book I enjoyed - so much so that I'm off to check out some of Ellis's works and maybe - just maybe - pick up copies of those previous Patterson-Ellis books. Gostei muito deste livro pela forma gradual com que vai aumentando o ritmo enquanto o enredo se torna cada vez mais interessante, deixando o leitor desesperado pela conclusão. Embora me tenha apegado instantaneamente à heroína da história (Emma) devido às dificuldades que tem para convencer o FBI a investigar uma série de incêndios de origem aparentemente não criminosa e que têm vindo a deixar um rasto de vítimas mortais, incluindo a irmã de Emma, levei algum tempo a interessar-me pela história p Gostei muito deste livro pela forma gradual com que vai aumentando o ritmo enquanto o enredo se torna cada vez mais interessante, deixando o leitor desesperado pela conclusão. Embora me tenha apegado instantaneamente à heroína da história (Emma) devido às dificuldades que tem para convencer o FBI a investigar uma série de incêndios de origem aparentemente não criminosa e que têm vindo a deixar um rasto de vítimas mortais, incluindo a irmã de Emma, levei algum tempo a interessar-me pela história propriamente dita...o «problema» é que, quando o fiz, não consegui largar mais o livro! Injustamente suspensa das suas funções no FBI, Emma decide trabalhar sozinha no caso, esperando reunir provas que justifiquem a abertura de uma investigação oficial. Contudo, quando todos os seus esforços se revelam inúteis, Emma não vê outra solução senão pedir ajuda a um ex-agente do FBI - e também seu ex-noivo! Sem exagerar na componente romântica, os autores conseguiram tornar o livro ainda mais interessante graças ao par Emma e Books. Emma é especialista em silenciar sentimentos e compartimentar emoções, colocando o trabalho em primeiro lugar, mas há sentimentos que nem ela consegue ignorar. O trabalho em equipa depressa lhes revela que estão perante um serial killer metódico, disciplinado e muito perspicaz. Quanto mais se aproximam, mais audacioso ele se torna e, consequentemente, mais perigoso. Inicia-se assim uma corrida contra o tempo em que Emma e Books perseguem este criminoso tentando evitar o próximo ataque mas acabando por vê-lo escapar uma e outra vez, frustrando todas as suas tentativas. Como já é habitual com James Patterson, temos capítulos dedicados exclusivamente ao ponto de vista do criminoso, aumentando a nossa curiosidade sobre ele, especialmente porque revela tendências psicóticas, revelando o prazer e diversão que tira das atrocidades que pratica. Foi o primeiro livro que li do autor e amei! A história mantém-nos presos desde o início e nunca desilude. E quando achamos que as coisas vão acontecer de uma determinada maneira, o autor dá-nos grande nó na cabeça. Os capítulos são pequenos, o que torna a leitura rápida e fluída. Adorei mesmo o livro, vou tentar decididamente ler mais livros dele e espero que sejam tão bons como este.